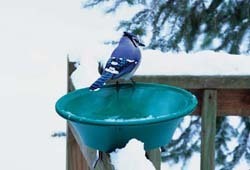 This Made in the USA durable, plastic bird bath provides a reliable source of water, even to temperatures below -20° F. Easily mounted to wood deck rails or our metal stands, it features a built-in 70 watt or 150 watt, fully grounded heater that is thermostatically controlled to conserve energy. 4-yr warranty. 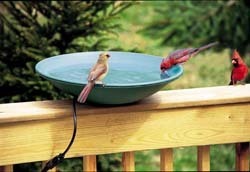 Comes in 2 sizes: 14" - 70 watts or 20" - 150 watts.